For anyone who wants to be ready for an emergency. Great for hikers, boaters, community leaders, activity directors, etc. This course is for anyone with limited or no medical training who needs a course completion card in First Aid, CPR and AED use to meet job, regulatory or other requirements. Examples would include Police Officers, Teachers, Coaches, etc. 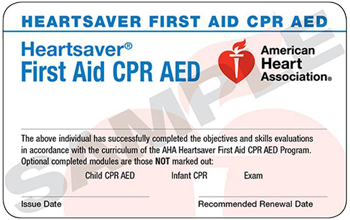 Heartsaver® First Aid CPR AED Online Part 1 is a Web-based, self-directed program. This program teaches students critical skills and knowledge needed to respond to and manage an emergency in the first few minutes until emergency medical services (EMS) arrives. Content includes how to help a victim with bleeding, sprains, broken bones, shock and other first aid emergencies. 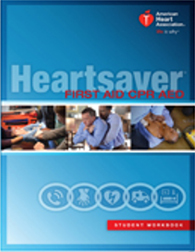 This course also teaches adult CPR and AED use. Part 1 can be completed in 1 hour to 1.5 hours. Continuing Education Hours: The American Heart Association has been accredited as an Authorized Provider by the International Association for Continuing Education and Training (IACET). The American Heart Association is authorized by IACET to offer 0.40 Continuing Education Units (CEUs) for the initial online course. A renewal online course option is not available at this time. Individuals are strongly encouraged to check with their specific regulatory boards, employees or other agencies to confirm that courses taken from IACET Accredited Providers and courses taken for IACET CEUs will be accepted by that entity. In the Online Courses, skills testing must be scheduled with an authorized AHA Instructor. Time to complete Parts 2 & 3 vary. Please contact Obsidian at (661) 360-6871 to schedule your skills practice and examination.